Note: this is a draft icon rendering for the Thunderbird 3 icon. Keep the feedback coming in, they’ve been extremely helpful and we’re doing our best to incorporate your suggestions. Please click on the image to see the large file. In this version we have the different sizes. The majority of people will view Thunderbird on a daily basis with the smaller sized icons. The larger icons will be displayed more on the web site, posters, and other promotional items like t-shirts. Uppermost right wing feathers are rounded to match the other side. Second row of feathers on the left wing slightly pointed. Based on feedback, we're choosing the white envelope with no seal. Please provide feedback via the comments section through these blog posts. LOVE IT! I think it's solid. My vote goes to this one! Great for this version of TB! just a little refresh because the changes are more in engine. The red mark or other main changes(colors, shape, …) should come on the next version of TB. Maybe a cloud between the wings??? I like it very much but I do think it could need a little more tweaking though. Amazing! And the 16×16 looks great too. The colours just don't seem quite right – too flat, not enough contrast. Take a look at the Firefox icon, its shiny, this version just seems dull. The beak gets lost on the smaller icons due to the similarity in colour to the envelope, actually as does the head. Unless you're close to the smaller ones, it is much harder to see. Sweet to see this moving forward! The only remark I have is that the 16×16 seems a bit unsharp compared to it's Firefox counterpart. So, as I noted last time, the crest feathers look round (and they shouldn't; feathers are flat!) and the lighting around the eye is not right. I'd still tone down the contrast of the feathers so they look more flat (like the top feathers). I suppose there is no chance of the striped feathers coming back? I agree with Dominic about the top feathers looking like scales. At the very least they have a clearly different style from the other feathers, which is not good. It's hard to say, but maybe just eliminating the highlight on the leading edge (which is not present on the flight feathers!) would be sufficient. I love it, except that the top feathers do look like scales somewhat. However, it is only shown in the largest one, with it lesser obvious in the small ones. I agree with a lot of the above. It's great, yes, but it does look too flat (deb00t's take on it is definitely fresher, but it kind of feels alien and unbalanced; still, a compromise between this and the current would be nice) and the top feathers do look like scales, which I don't like that much. The bottom feathers on the right wing could maybe use another feather to transition more smoothly in shade, but that's just nitpicking. Overall, it looks great, though. It's just the very little things now. We'll take another pass on trying to add shine and make less flat, although I think we're nitpicking with the rest. I do agree with the beak color and we tried with a yellow beak but looked too much like the twitter bird. I'll post that in a bit, but I think we're going to stay with the gray. On the "fish scales", birds do have feathers that do look like this and are layered that way. The only thing I can think of is to add texture to those feathers. http://www.dmcquestion.com/images/00_Commissions/Red-tailed_Hawk_commissioned_1.jpg We also don't need to be so technically accurate with the icon. Do they egregiously look like "fish scales" and we need to change it, or what do you suggest? I think some changes to the texture, to make it look softer and more flat would do the Trick. I agree with deb00t, his colored "Shredder Tweak" icon looks much more fresh and vivid! Green color is really great addition. I apologize for jumping in here in It7 without having participated in previous iterations; I should pay more attention to this sort of thing, I guess :-\. Anyway, looking back at the previous iterations, I'm not too clear on why the seal idea was discarded. I rather liked it, to tell the truth. Any chance it might make it back in? deb00t's green tweak is interesting, and suggests some lines for further work; of course, I don't know how well it'd fit with Anthony's mental model of the project. @SLA80: I don't think it's critical that the small feathers be distinct at that size… I don't think they /would/ be on a real bird (well, depending on species). And they aren't in the old icon, there you are seeing the *stripes* (that we no longer have). Though if the idea is to make the tips a lighter color (i.e. re-add stripes, of a sort), that works, and might fix the "fish scale" problem. @rebron: The problem with the "scales" is that they are lit in a totally different way from the other feathers; there is a highlight on their edges that is not present on the other feathers. Inconsistent lighting is bad, period :-). Specifically they look like they have thickness, which is wrong. 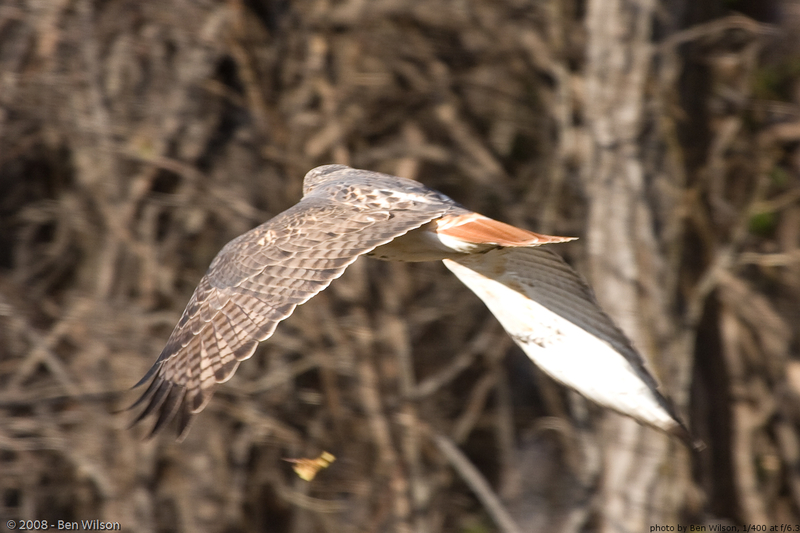 If anything, there is more depth to the flight feathers, because the leading feathers form a smooth, flat surface, while there is some space between the flight feathers that is causing shadows (the feathers themselves are still flat). I'd still like to see the crest looking flat and the eye looking less flat :-). i think the shadow on the bottom of the envelope makes it look too round. less shadow, will make the envelope look more flat (i.e. the way an envelope is actually shaped) and make the lighting more correct and less confusing. also the iris of the bird should probably have a slight highlight for the smaller version as it just becomes a sort of shadowy hole. other than that i love the new icon. i think the colours are perfect, i think the details (both on the bird and the envelope) are perfect. the only other thing, is that the (implied 3d) depth of this icon (based on the shadow and the angle/foreshortening of the bird/envelope), while not a problem on it's own, does not match the firefox logo's (and windows 7's) front-facing, flatter style. @Matthew: I think, it IS highly critical, since 32×32 and 48×48 are standard desktop icon sizes for WinXP and WinVista/Win7. 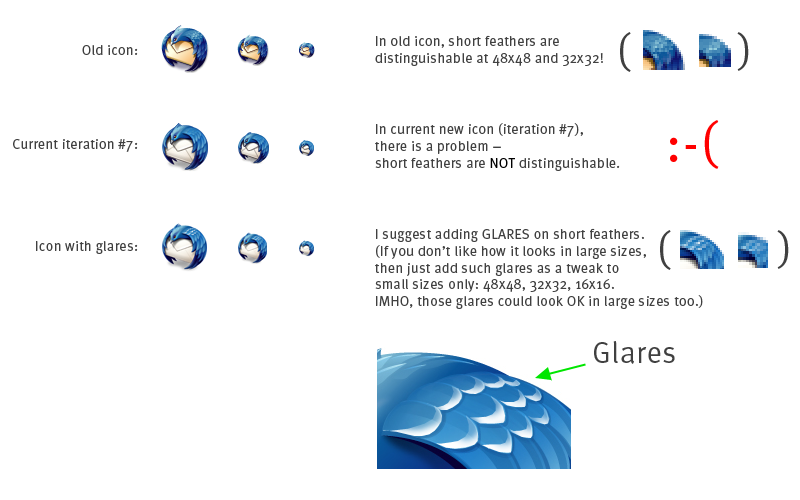 And it doesn't matter, how you call it – "stripes" or "glares", we need this tweak anyway. @A.Piraino & R.Ebron: Please, don't forget to create "Document Icon" for Thunderbird (for .EML files). Hi, i really like the new style of our beloved thunderbird. – I liked the warm colors of the envelope from iteration 3-4, why were they removed? – What about creating a smoother transition between the body and the wing (right side)? – The last two feathers on the right look a bit off.. like, they are too long compared to the next row of feathers. – White glares for the smaller icons sounds like a good idea to me. – I think theres still potential in the feathers for a stronger 3d effect. Are you still working on this? I haven't heard anything for quite some time. We're going to be putting up the final icons soon if not this week. I’m also waiting very tense for the final version of the reworked logo … will you also realease a high-quality SVG version of the new Logo or just PNGs? Any updates on the final version we can apply to our Thunderbird 3 installs? Just grabbed RC1 with the logo in there. The eye surrounded by the white in the smaller version looks almost demonic! Not liking the white in there. * Another thing that popped out on the first time i saw this is that the shine is far much more bright then the firefox tail's blaze shine..
* The envelope is way to bright, as you can see in this photo posted by Andreas Nilsson: http://dl.dropbox.com/u/184285/tb-fx-16comp.jpg you can see how pale the new logo looks compared to the firefox one. * row 3 have only 3 feathers, by the looks of the reference pictures all the feathres lines are full. I think that might be the thing causing the scales look. I know it's a bit late, but regarding the logo in final 3.0 version (eg. here: http://www.spreadthunderbird.com/), I had a similar impression as Kevin in comment 27. It appeared to me a bit ghastly, somehow pale and with red eyes. It could be a character in a movie named 'Messenger from the Hell' :) Maybe changing a bit the blue feathers and yellowish eyes? Anyway, congratulations for your great works, and sorry for not participating in the previous iterations.